This book provides a vivid historical ethnography of the 1970s Northern Soul Scene, drawing on the author's personal involvement in this as well as extensive research. The book examines how cultural patterns and normative standards are established through individual practices and group interaction,and aims to show how participants in the scene became converted to actions that they once thought unacceptable - for a substantial majority this was amphetamine use, and for a minority, opiate use and burglary. The book shows how early social background experiences influenced how quickly participants started using amphetamines and whether they subsequently became involved in criminal activities such as the burglary of pharmacies, and suggests a link between burglary of chemist shops, opiate use and fatalities from drugs overdose. Such high-risk behaviour is associated with previous delinquency and early social background, rather than the nature of involvement in the subculture.The book shows how early life influences have a powerful impact on shaping social identity, attachment to the subculture, and involvement in crime. 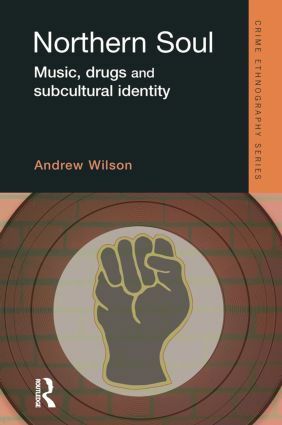 How and why individuals become involved in the subculture, and the impact it had on identity, are central themes to the study. The findings suggest that while involvement in the Northern Soul Scene provided valued memories and friendships, it did not impede movement to the conventional roles and responsibilities of adulthood. The book concludes with a summary of its implications for the sociology of adolescence, subcultural theories and deviant careers.